Thank you so much for your Father's Day Top Pop entries. Please vote for your favorite essay from the finalists below. The winner, announced June 8th, will receive a portrait session with their dad! The first person who ever saw me take my fist breath was my father, and it is a moment that has bound us forever and something we will both never forget. After I was wrapped up and a funny hat was put on my head, I blinked at my dad, he introduced himself and gave me a kiss. Less than an hour later, he was gently washing my hair, and giving me my first bath. My dad has to work long hours at the hospital, but no matter what time he comes home, no matter how many hours he has been on call, he is still there to feed me and give me a bath at night. It is my favorite time of day, we sit together, I splash in the water and talk nonstop about my day. Dad is always patient and lets me sit in the tub until I become a prune, even if he is hungry and is still wearing his scrubs from work. The other morning, I was up really early, and mom brought me into bed with her and dad. I was a little cranky, but turned my head and saw my father and said , with a big smile, “Dada!” Daddy was pretty tired, but after that, he was ready to start the day with me. I have not done or seen a lot in my short life, but I know what that I have learned some of the best examples of unconditional love from my father. He puts me (and my mom) before anyone and he is always happiest just to sit on the floor and read to me (the same book over and over) or play with Elmo. He never acts impatient and he always gives the best hugs. I cannot say how much I love my Dada! My name is Nathan and my Daddy is very special to me. In my 22 months of life my Daddy and I have become very close! Well actually, it all started before I was even born. My Daddy read Goodnight Moon to me every night while I was growing inside my Mommy’s belly. It’s one of my favorites now. For my first birthday Daddy made me an Elmo birthday cake from scratch for my party because I love Elmo. We spent my first birthday day together. He took a vacation day! We went on a train ride to the next town for a special treat and he took me to the store and let me pick out my very own birthday balloon. I picked Elmo of course! My Daddy does a lot with me now that I am getting bigger! We have silly games we play together. He crawls around the house chasing me, lets me feed the dog (I always give her too much but Daddy doesn’t care), and dances to my Baby Einstein CD with me. He takes me for walks and lets me bring home rocks from the grader truck that is working on the road. We have a rock garden now! Three days a week, Mommy goes to the gym and I get to spend time all alone with Daddy. It’s the best! He lets me vacuum with the real vacuum, play with the cell phone and even pretend to drive the car. I even get to add all the ingredients and turn the mixer on to make my Saturday morning pancakes. Mommy would never let me do those things! He takes me to playgrounds, the beach and the library too. I love the times when it’s just me and Daddy! Daddy is very helpful to my Mommy and that makes her happy. He doesn’t mind changing diapers and cooking dinner. He gives Mommy a break so she can go shopping and do Mommy things. He does lots of projects around the house. He made me my nursery. (He had to finish off my entire upstairs of my house-it was a big project and it’s really nice now). Right now, he is painting a little table and chairs for me and when he is all done he is going to make me my very own sandbox. I am one lucky little boy to have such a special Daddy! I love him very much and I know he loves me. He shows me all the time. Happy Father’s Day Daddy! My name is Nelson, I am 8 years old. My daddy is the best because of many reasons. He is a hard worker all week but always takes Sunday as our Family Day. 2 of my baby sisters first words were "Fammy Day!" because daddy makes it so special for us. He even says no to golfing with his buddies on Family Day. Any chance he gets he asks me what I want to do with him. Sometimes we throw the football around, sometimes hit a baseball and run the bases, sometimes kick a soccer ball around. In the winter, he always takes us sledding. Lately we've been playing Frisbee. He always finds a way to include my baby sister who is almost 3 years old (even though she makes it hard sometimes!). Once he took me to see a movie and we were the only ones in the theater. Before the movie started, daddy had me cracking up so much because he went up on the stage and was doing a really silly dance. I was hoping someone would walk in to see him!! I wish I had a picture of that ! On my birthday, he took me and 5 of my friends to see Meet the Robinson's--that was so much fun. My dad loves my mom SO much. There isn't a day that goes by that he tells me and my sister how wonderful and beautiful our mom is. He makes sure we appreciate everything she does and that we treat her right. The picture is my dad helping me make my first pizza, which we did one family night. I think I put too much cheese on it, and making it was more fun than eating it. We've made lots of pizza since then, usually me and Maya make them now and mommy and daddy eat them. These are some of the reasons I think my daddy is Top Pop! Who's daddy is Top Pop? Webbed Bliss... love that phrase. And love this article from the Wall Street Journal detailing the trend of brides and grooms posting everything about their courtship, engagement, wedding plans, even streaming video from their actual wedding day, all online. Thanks for sharing, Sam. Bostonians Rosemary and Adam are so in love and their wedding day reflected every ounce of their affection and adoration for one another. I had a warm fuzzy feeling inside being around these two all day long. It was a busy day, starting with shaves at a barber shop for the guys and hair & make-up at a hotel for the ladies. The ceremony and reception were at the State Room in the financial district, with gorgeous panoramic views of Boston Harbor at sunset. Many thanks to Rachel, Eliza and Vanessa from WedBoston for their hard work on organizing this beautiful event. If you can believe it, these two don't think they are photogenic! Funny, because I think they are one of the most expressive couples I have ever photographed! They certainly aren't camera shy! They didn't want any portraits, per say, but luckily I was able to convince them to go outside into the courtyard for a few! Below are just a few images from many fun pictures of the day. So be sure to view the slideshow. This was definitely a party crew, so it seemed appropriate to shoot their rings on shot glasses. The guys were sluggish to start on the wedding day at the barber after a late night. Technically, this isn't the best photo, but I couldn't resist capturing the moment. The guys get prepped for their shaves. Beautiful Rosemary is ready to go! The kiss! The pretty cake. Green was the accent color of the day. Stealing a kiss in the photo booth (they used the pictures for their guest book). Entries for the Father's Day Top Pop contest are due by next Thursday! Be sure to submit a brief explanation on why your father is the best (moms can help with the submissions for children), and don't forget to include a photo! The winner receives a portrait session with their dad. I knew I adored the LaCour folks when I met them, and I just learned another reason why! Mark and Erin have a dog, Wylie, that looks very much like Dakota. Long-lost relatives, perhaps? And Pat Callahan, the evening news anchor for the NBC affiliate here in Portland has a dog, Winston, that gets mistaken for Dakota when he's out and about in town. 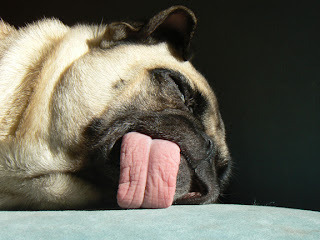 Below is a video of the sister to the pug who was a finalist in the dog contest (you know, the one with his tongue hanging out) waiting for the mailman, as she does daily. Too funny! As of today, the USPS increased the price of a 1st Class stamp to $0.41. But the price of the 2oz wedding stamp has decreased from $0.63 to $0.58. Cool. I spotted the new stamp designs online and thought I would share. They should be available for purchase mid-summer. Thank you, Margaret, for the wedding stamp blog tip! My friend and brilliant marketer, real estate agent Scot Aubinoe sends his top clients monthly surprises in the mail- jams, Starbucks gift cards, movie passes, seeds for the garden or tips for general household maintenance. It's something fun that I look forward to in the mail each month and definitely keeps his name in circulation. Today, his note outlined the change in stamp hike, and included a sheet of $.02 stamps to help ease the transition. Thank you, Scot. When I was in DC, I was lucky to photograph several clients and friends. Below are a few images from those some of those sessions. Rebekah and Jamie in Owings Mills, MD (Rebekah's sister Amanda is my favorite officiant and she lives in the Baltimore area). Baby Patricia (I photographed her parents', Jenny and Bob, wedding in 2004). Baby Eleanor and her mom Amy and dog Rocco (I photographed Amy and Greg's wedding in 2004). Click the image to view larger. ps- the best part about my new liveBooks site? I can easily update my images, and have added a few of these portraits already! Following the success of last month's doggie contest, I'm announcing another just in time for Father's Day! Looking for the perfect gift for your dad? How about a portrait session with emilie inc. of you and your dad? To enter, email me a short essay explaining what makes your father Top Pop and be sure to include a photo. Be specific- share poignant memories or moments or anything that will make the judges laugh, cry or adore your dad like you do. Submit your entry to photo@emilieinc.com by May 31st. Voting will take place the following week and the winning dad will be announced on June 8th (in time to get a gift certificate in the mail to the winning entrant to present to his/her father on June 17th). Congratulations to Howie who won the dog photo contest with 42% of the vote. Thank you all so much for your votes (more than 400!). Howie's parents, Megan and Sean, were guests at a wedding I photographed last month. I look forward to meeting and photographing Howie soon as his prize for the best doggy mug. I met Shandi a few years ago when I photographed an event she organized for the Breast Cancer Coalition in DC. Then I photographed her friends' wedding, Bonnie and Eric, in 2005. So it was like seeing an old friend when I traveled to DC for Shandi's wedding to Justin last weekend. The beautiful Shandi with her new husband. Everything is lush and in blooming in DC! I have seen these countdown clocks before, but never seen one on the actual wedding day. Too cute! The beautiful St. Veronica Catholic Church in Chantilly, VA. The theme of the day was pink! Check out these fabulous shoes! There was a very large bridal party and all the ladies were in pink and orange. The reception room was lit in pink and the beautiful flowers were shades of pink and orange. This was a first! Shandi and Justin decorated Bonnie and Eric's wedding night suite during their wedding reception and I took a picture of Justin laying across the bed surrounded in rose petals. Bonnie and Eric wanted to return the favor and kick it up a notch for Shandi and Justin's wedding night suite for their picture. Um, I think they did! Thanks again for everything, Shandi and Justin. I loved spending your special day with you. I hope your honeymoon to the Dominican Republic was just as beautiful as your wedding day! As you may have noticed, the blog has been a bit of a mess lately. But thanks to my fantastic designer Sharon, it has all been safely moved to its new permanent home, www.emilieinc.net. So please bookmark this new site (and erase emilieinc.com/blog). You can always access this from my website if you get lost or forget. Look for a redesign of the blog to match the new website in the weeks to come. Thanks for your patience! 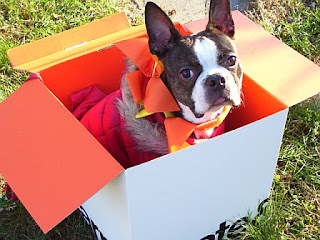 One more day left to vote for your favorite dog photo... scroll down to last week's post about the details! A few times each week I workout with four other small business owners at a personal training studio. We all look forward to the social time as well as the obvious benefits of exercise. One woman, Maryann, is branching out on her own to offer customized personal training to people via email and telephone training, as well as in-home training locally. She just launched her new website and I was lucky enough to take her bio head shot. Altho her main focus is baby boomers, be sure and check out her bridal program, too! Maryann's website: Healthy Body, Fit Mind. I had a fun photo play date with John and Meg in Portsmouth last week. We played with dolls and baseballs and rode bikes and had pb&j. John, 4, loved the camera and was very interested in learning about photography and Meg, 3, was happy to mug for me, showing off her many expressions. Here are just a few of the 400 images from the morning. How sweet are those freckles? As usual, I just played along with what Meg and John wanted to do, including tours of their bedrooms. I loved their claw foot tub in the bathroom. Last year when Bostonians Stephanie and Craig booked me, they had just come from visiting their reception site in the rain and said it was still beautiful. Good thing! It rained on their wedding day, too, but only when everyone was celebrating inside at their reception. And yes, it was still beautiful. As you may have noticed, I've been trying to keep my blog picture posting to the unique images from the day. In my fourth year of shooting weddings, I am constantly looking for things that make each wedding different. Here are a few from Stephanie and Craig's day. The bridal party stayed at the rustic Dockside Guest Quarters in York. Stephanie wrote a card for her soon-to-be husband. Craig reading her card on the front porch. At the salon, Stephanie's bridesmaid Kristen tried to stay out of my way while she was taking pictures. No, this isn't Stephanie. It's prom time... this high school student came in to show off her dress to the stylists. She made it herself- out of duct tape! You go, girl! Now this isn't technically the best photograph, but I had to giggle when it looked like the bridesmaids were naked seated in their strapless dresses. Finally! Here's the newlyweds on their way out of the church (St. Theresa's in Rye Beach, NH)! In between raindrops on the porch, a view of the reception and band indoors. Thanks for a great day, Stephanie and Craig! I hope you had a great honeymoon (and didn't spend too much time online looking at your pictures!)!! Thank you all so much for your wonderful dog photos! I received over 50 entries and it was difficult to narrow it down to just 3! You all have absolutely adorable (and photogenic!) pups! Below you will find the finalists. Vote for your favorite through May 10th (you can vote once a day). The winner receives a free pet portrait session! 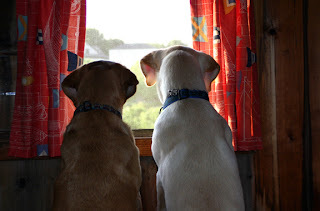 What is your favorite dog photo? 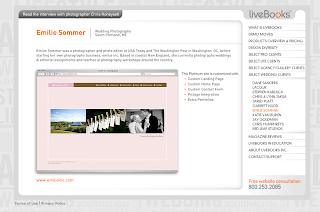 Wow... my new site was chosen as one of the 'select wedding' sites on the liveBooks homepage. Cool! Now if only I could get this blog back to normal. Soon!